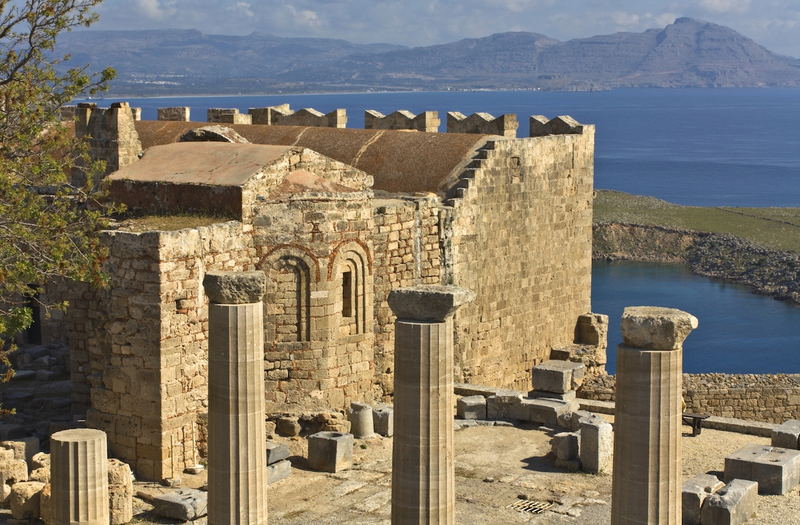 Beneath the modern village of Lindos lies buried one of the most important ancient cities of Rhodes and the eastern Aegean. 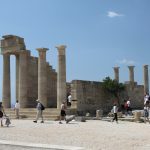 Beneath the modern village of Lindos lies buried one of the most important ancient cities of Rhodes and the eastern Aegean. 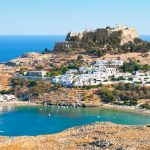 The only visible today ancient monuments preserves the mighty bare rock that rises from the sea at an altitude of 116 meters and is a landmark of Lindos’ landscape. 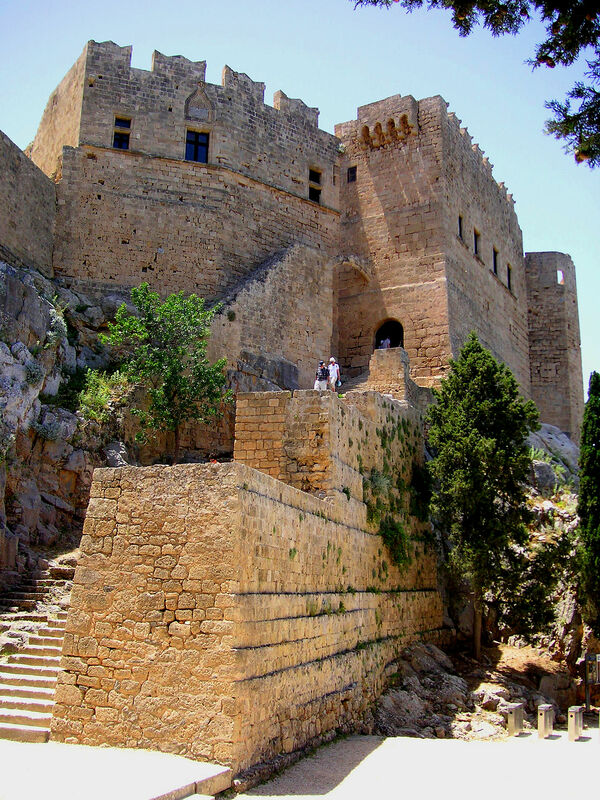 This is the monumental citadel of the renowned in antiquity sanctuary of Athena Lindia and the medieval castle of the Knights Hospitaller. 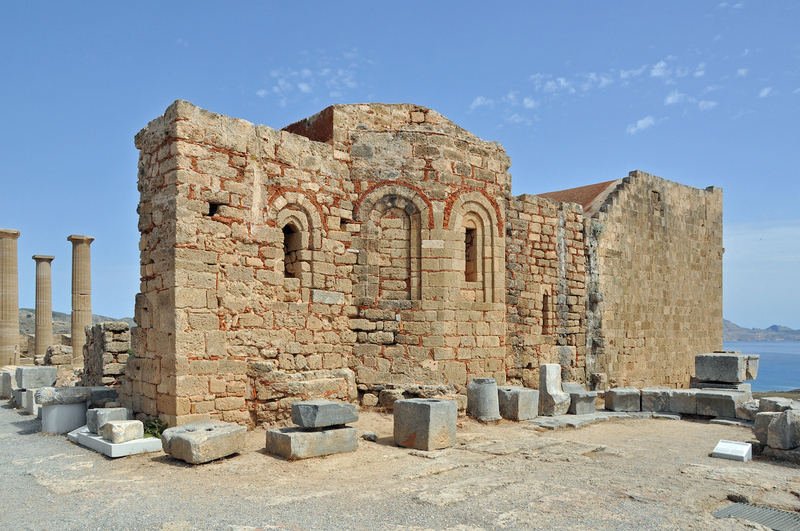 Lindos’ history, though, starts much earlier, as evidenced by the occasional finds that came to light in the wider area and date from the Neolithic to the Mycenaean periods. Already from its historical dawn, Lindos rises through the haze of myth as a powerful force. Tlipolemos, son of Hercules, is mentioned as the first settler who brought his Dorians to Rhodes and founded the three major cities of the island, Lindos, Ialyssos and Kamiros, which together with Kos, Cnidus and Halicarnassus formed later a strong confederation, the “Dorian Exapolis”. 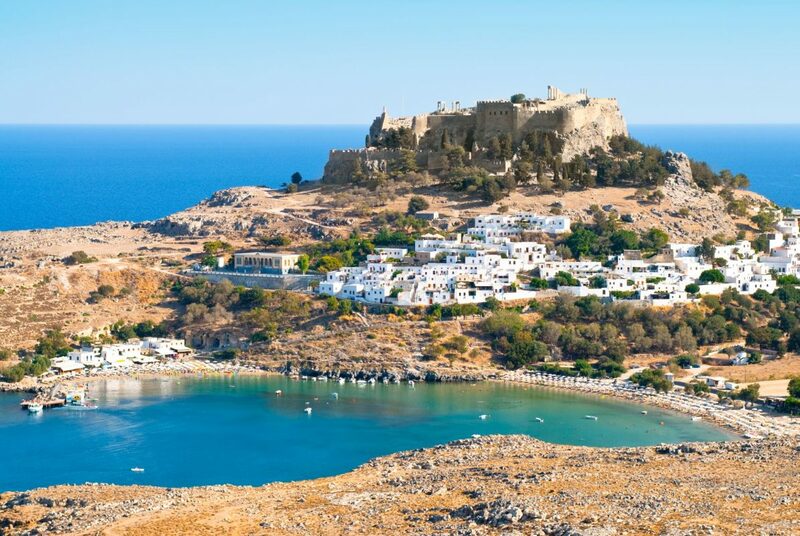 Situated advantageously at the bay of Megalos Yalos, Lindos secured control over the western side of the island. 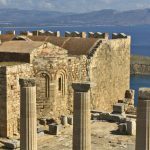 Furthermore, Homer lists Lindos among the Greek cities that took part in the Trojan War, a quite early testimony of its naval power. 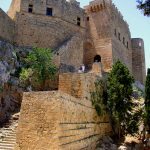 The golden age of Lindos was the Archaic period (7th-6th centuries BC), when the city participated in the Greek colonial movement, founding, among others, the city of Gela in Sicily. Dominant figure of the 6th century was the tyrant Kleoboulos, one of the seven sages of the ancient Greek world. In his years were erected the first monumental buildings of the acropolis, such as the temple of Athena. In 408/7 BC Lindos, Ialyssos and Kamiros co-founded in the northernmost part of the island the greatest city-state of the time, namely the city of Rhodes. 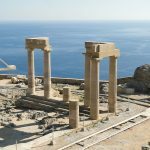 Although it ceased to be politically and economically independent, Lindos remained an important center, thanks to its famous sanctuary, which acquired a monumental form with propylaea and staircases in the Hellenistic period. During the Middle Ages the ancient citadel was used as a fortress and its defensive character was reinforced, especially in the years of the Knights’ reign (1309-1522). Today, the ascent to the Acropolis follows the same steep path as in antiquity. Outside the castle the visitor is greeted by the stern of a ship carved on the rock. The relief depicts a triemiolia (τριημιολία), the characteristic type of ancient Rhodian warship, and was the base of an admiral’s statue, Agesandrus, made by the sculptor Pythokritos. The medieval castle, with the Knights’ coats of arms still hanging intact like sleepless guardians, encloses the entire surface of the hill. Its massive walls follow the natural terrain and have a circumference that reaches 508 m. in length. The external staircase of the fort leads to the main administrative building and also to the nearby Byzantine church of St. John. The ancient sanctuary occupies the top of the acropolis. To reach the temple of Athena, one passes through the great Doric stoa and then ascends the 34 stairs that end up to the propylaea. The view of the restored monuments clearly illustrates the ancient architect’s calculation for perspective and emphasis to theatricality. The Doric temple of Athena is built at the peak of the rocky hill, where the stepped ascending route reaches its end. Its prominent location offers a spectacular panoramic view of the other monuments and the sea. The temple that is preserved today was built in the second half of the 4th century or in the early Hellenistic period, succeeding Kleoboulos’ temple, which was burned down in 392 BC. 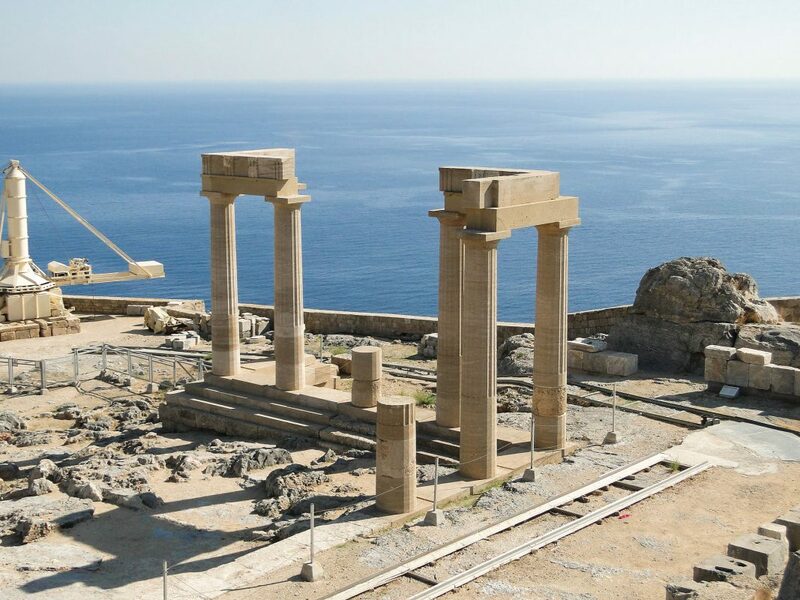 According to the Chronicle of Lindos, the most important ancient source about the sanctuary, the cult statue of the goddess in the second temple was of a style similar to Pheidias’ gold-and-ivory statue of Athena in the Parthenon. Beyond the acropolis, other monuments of the ancient city can be seen today scattered in the wider area. Below the temple of Athena lies the ancient theatre, built on the NW side of the hill, and next to it the Tetrastoon, a building most probably used for cult rituals. To the NE of the acropolis lies Voukopion, an area of sacrifices, as evidenced by the 38 inscriptions preserved in the surrounding rocks. 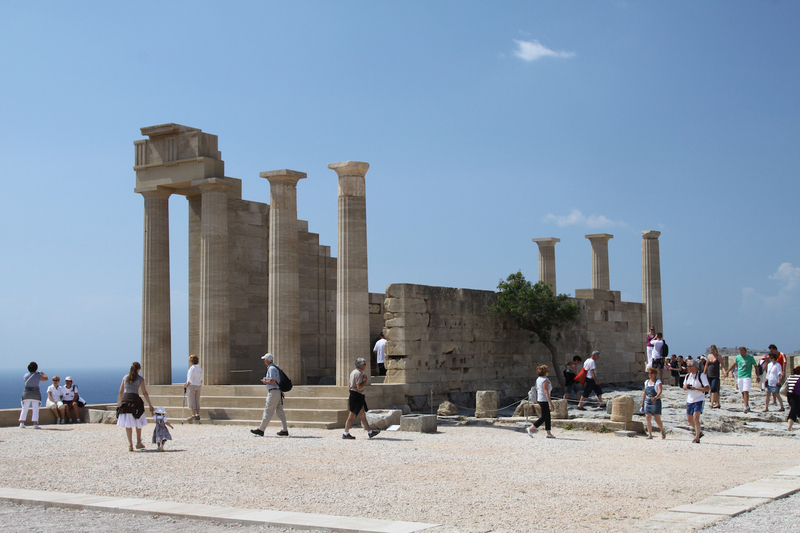 Another two important monuments are Archokrateion and the Tomb of Kleovoulos, namely the tombs of two eminent families of ancient Lindos. Both monuments were later converted to Christian churches. The traditional settlement of Lindos is an attraction in itself. 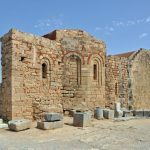 The sight of the 15th century church of Panayia and the many mansions dated as early as the 17th century bear witness to a glory which never faded over the course of history.